The main reason we went to Scotland was to take a barge cruise through the Scottish Highlands with Caledonian Discovery. During that cruise, we would be hiking, biking, and boating slowly through the Highlands. Therefore, we knew we would see plenty of Scottish Highlands’ nature during that time. However, there are other things to see in the Scottish Highlands like castles, cathedrals, and distilleries that we wouldn’t see on our cruise, so we also decided to spend four days on a Scottish Highlands road trip. 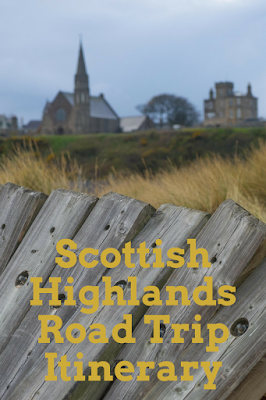 Our Scotland road trip itinerary took us from Edinburgh to Inverness with overnights in Stirling, Braemar, and Urquhart. Our first stop on our Scotland road trip itinerary was Dunfermline to visit its abbey and palace. Dunfermline is one of Scotland’s oldest settlements and also used to be its capital. Dunfermline Abbey was so important to Scotland it was once the burial place for Scottish monarchs including King Robert the Bruce (minus his heart). The Abbey was founded by Queen Margaret in the eleventh century, and she is also buried there along with her son David I. The current nave, built in the twelfth century, is built upon the original foundation of Queen Margaret’s church. There is also a parish church, built onto the eastern end of the abbey in the nineteenth century, which is still in use for religious services. In addition to the abbey, there are also remains of a palace which was built by King James VI in the sixteenth century for his queen Anna of Denmark. Dunfermline Palace is also the birthplace of Charles I, who was the last monarch born in Scotland. No road trip through the Scottish Highlands is complete without a visit to one or more Scotch whisky distilleries. Our first distillery tour of the trip was at Deanston Distillery, which is a craft distillery run out of an old cotton mill. Deanston Distillery is unique because it generates its own electricity and is the only distillery in Scotland to do so. Doune Castle is probably best known for appearing in Monty Python and the Holy Grail, but it has also been in the Outlander series and Game of Thrones. 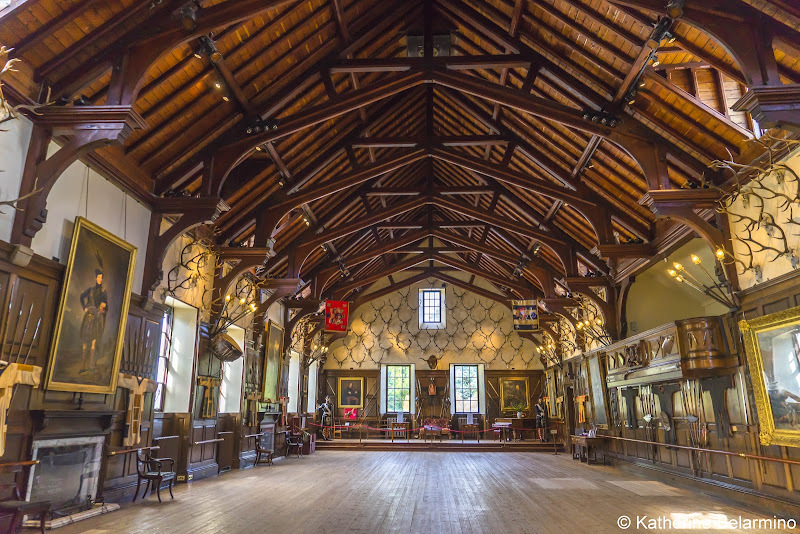 Stirling Castle is one of Scotland’s largest castles, with many buildings and rooms to explore. One of the oldest remaining buildings was built in 1503. The castle was conquered by Robert the Bruce and it is also the site of the coronation of Mary, Queen of Scots. When visiting Stirling Castle, don’t miss the graveyard of the church next door. It is one of the most beautiful cemeteries we have visited and has gravestones dating back to 1579. Towering over the town of Stirling is The National Wallace Monument, built in 1861 to honor William Wallace. The monument overlooks the location of Scotland’s victory at The Battle of Stirling Bridge, which was led by William Wallace and Andrew de Moray. Since we had a rental car, we could stay wherever we wanted to and didn’t necessarily have to stay in a city or town. We wanted to stay in unique accommodations during our road trip, so our first stay was at Broomhall Castle, outside of Stirling. Broomhall Castle isn’t a medieval castle, but it is a baronial mansion house that was built in 1874 in the style of Balmoral Castle. Our room was large and colorful with a cozy little sitting area in a room formed by the castle’s curved tower. The bathroom included a claw foot tub and exposed stone wall. Broomhall Castle has more than great rooms. It also has a very good restaurant where we enjoyed an exceptional dinner which included pheasant breast with blood pudding, chestnuts, and green apples as well as lamb two ways, one of which was in a mini shepherd's pie, which was so good. There was a little bit of buckshot in the pheasant, a warning we saw on a few menus throughout Scotland, which is supposed to be good luck. In addition to the restaurant, Broomhall Castle has a small bar and a cozy lounge area where we enjoyed some local whiskeys. A stay at Broomhall Castle also includes a full English (or Scottish I suppose) breakfast. One of our favorite palaces that we visited in Scotland was Scone Palace. Not only are there many rooms to explore within the palace, the over 100 acres of grounds offer many gardens, points of interest, and long walking paths. Unfortunately, no photos are allowed in the palace. A self-guided tour through the palace passes through luxurious State Rooms and rooms filled with historic furniture, paintings, porcelains, ivories, clocks, and more. Our favorite discovery was the papier-mâché collection. This collection of vases, bowls, and other items from a distance look like rich brown carved wood. There are also some dishes painted a brilliant green, a color derived from the use of arsenic. If possible, set aside enough time to explore the palace grounds too. There are three walks from which to choose, taking as little as ten minutes to as much as an hour. You can also grab a bite at the coffee shop or bring a picnic to enjoy outdoors. Some highlights from the 100 acres of land include Moot Hill and its chapel, the ancient burial ground of Scone, and the Murray Star Maze. Dunkeld Cathedral is another cathedral that is part restored for use and part in ruins. Dunkeld Cathedral was first built in the ninth century to be the head of the Celtic Church, but the current building dates back to the early 1300s. The choir got a new roof and is used today as a parish church. The rest of the cathedral is preserved as a Historic Scotland Ancient Monument. The town of Dunkeld was also the site of a Jacobite battle, when the town was burned. The town was rebuilt and became a market town. The bridge was built in 1809 to allow communication and transport, but Dunkeld did not thrive. The upside to this is that Dunkeld has retained a quaint look from another time thanks to the National Trust for Scotland. Another distillery for a Scottish Highlands road trip itinerary is Blair Atholl Distillery. This distillery is one of the oldest in Scotland, having been founded in 1798. It is now one of the 28 distilleries in Scotland which together create Bell’s Blended Scotch Whisky. 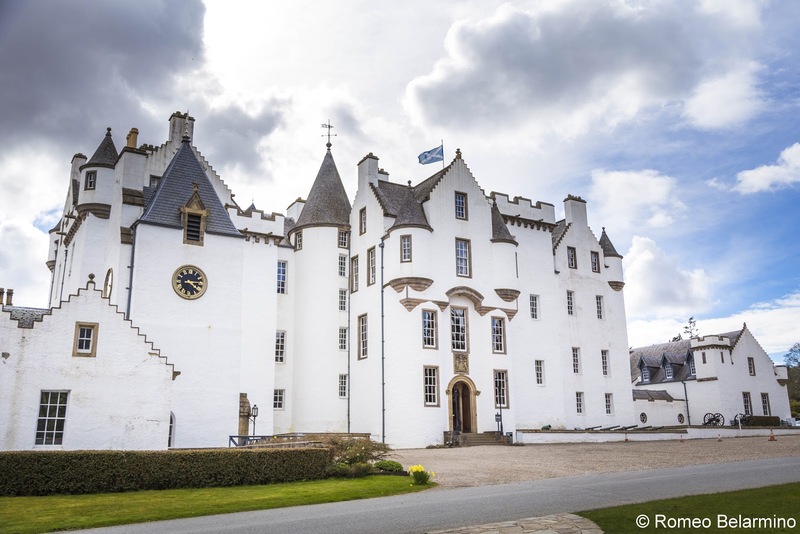 Blair Castle has been the home to the Earls and Dukes of Atholl for 700 years. The title first went to the Stewarts in 1457 when James II gave it to his brother John Stewart. The title stayed with the Stewarts until it went to the Murrays, starting with John Murray. The castle has been renovated many times. However, a small part of the castle is quite old, Comyn’s Tower, which was built in 1269. The castle has a number of beautiful rooms in which, unfortunately, photography is not allowed. These rooms include the entrance hall, covered in muskets, dining room, drawing room, and tapestry room. Photography is allowed in one room, the grand ballroom, covered in paintings, weapons, and antlers. This room is now used for events. 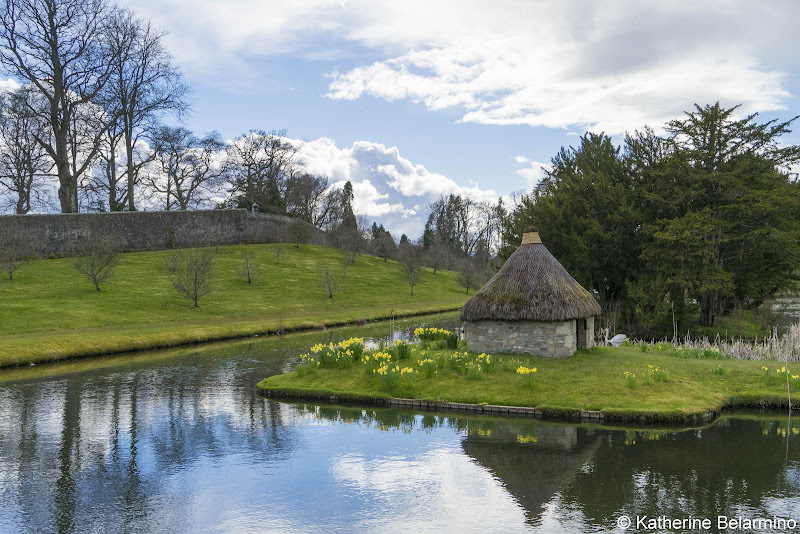 Outside of the castle are extensive grounds including a wooded grove, a deer park, fields, and a nine-acre walled garden with ponds, a bridge, swans, and an orchard, all looked over by a statue of Hercules. There are two things that make a road trip enjoyable. One is all the stops along the way, but the other is the scenery along the drive. One of the prettiest areas through which we drove was Cairngorms National Park. While we could have spent days exploring the National Park, our schedule only allowed a drive through the park. On that drive we saw sheep, red deer, snow, heather, waterfalls, streams, stone bridges, and a whole lot more pretty scenery. Callater Lodge was built over 160 years ago as a hunting lodge by a noble. It was used three months per year during the hunting season. It has been owned by the current owners for almost three years. Callater Lodge is a true Scottish Highlands bed and breakfast. It is located in a small town, which also happens to have the highest elevation golf course in Scotland. Callater Lodge is surrounded by nature and beauty and quiet, and we kind of wished we had a couple more nights there. Our room was cute and cozy, with a four-poster king-size bed, but probably our favorite part of our one-night stay was the breakfast, which included eggs from the owners’ chickens, meat from the local butcher, local salmon, and homemade breads, granolas, and preserves. For dinner we went across the street from Callater Lodge to Braemar Lodge, the best restaurant in town. Braemar Castle is a typical L-shaped Scottish castle with a central tower staircase flanked by two wings. The castle was originally built as a hunting lodge in 1628. Since Braemar Castle was occupied for centuries, it is unusually decorated in the style from when it was last inhabited, the 1950s. It is also the site of the famous annual Braemar Gathering. Balmoral Castle is the summer residence of Queen Elizabeth, which unfortunately for visitors means that even when the Queen is not in residence, the only room of the castle open to the public is the ballroom. However, the grounds are beautiful and an interesting audio tour leads guests around the grounds, outbuildings, including a greenhouse, and the ballroom. 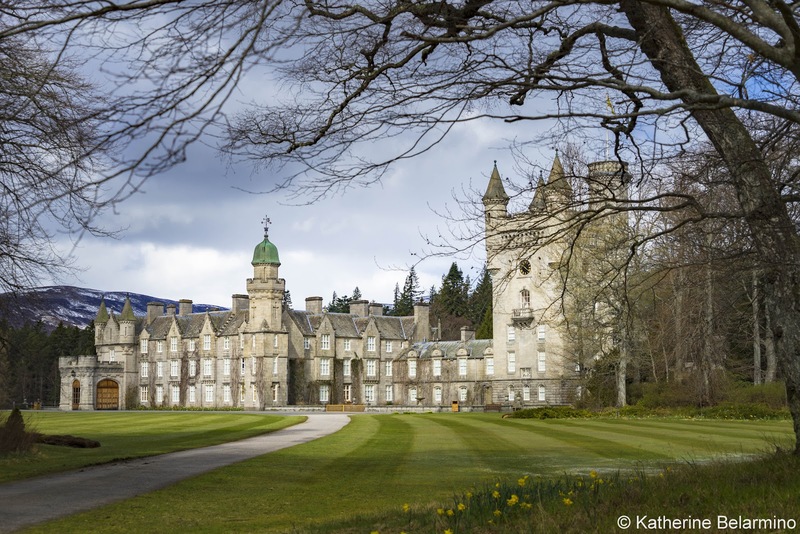 The audio tour provides the history of Balmoral Castle and some touching insight into the life and relationship of Prince Albert and Queen Victoria, who purchased the land and built Balmoral Castle, Queen Victoria’s favorite place to be. Kildrummy Castle is related to Braemar Castle as it was the home of the Earls of Mar, who built Braemar Castle as their hunting lodge. Kildrummy Castle is in ruins now, but played an important role in the Wars of Independence. The castle was abandoned when the Earl of Mar had to flee to France after supporting the Old Pretender. Fyvie Castle is another of Scotland’s castles that not only boasts a beautiful interior, but also has large, picturesque grounds. The castle was first built in the thirteenth century and was visited by both Robert the Bruce and Charles I. For a little added excitement, the castle is also said to be haunted. Since we had our own wheels, we were able to yet again stay at a unique hotel outside of town, this time in an old church. The Old Church of Urquhart Hotel is really a hotel in a converted church, and it is a short drive from the town of Elgin. The owners offer dinner, though we chose to go into Elgin and Lossiemouth for dinner, and breakfast is provided every morning. There is one small payoff for having the opportunity to sleep in a church, and that is the room can get pretty cold at night. While the other distilleries we visited made Highlands whisky, Glen Moray Distillery makes Speyside whisky. Speyside is a small region within the Highlands that, despite its small size, contains almost half of Scotland’s distilleries. Glen Moray has been distilling whisky since 1897 just outside of Elgin. Glen Moray’s single malt whisky is made with locally malted barley and water from the River Lossie. Whisky isn’t the only popular product that comes out of Scotland. Another popular product is wool, especially cashmere. Johnstons of Elgin has been making cashmere and fine woolens since 1797. One of their not-so-secret secrets is the soft water from the nearby river. Visitors can tour the mill and watch the entire manufacturing process and see the over 6,000 colors and well-known patterns, such as Burberry. However, photos aren’t allowed in many areas as there are some items being made they must protect from being copied. It’s a fascinating look at one of Scotland’s crafts, and there’s shopping at the end, which is always exciting. Our Scottish Highlands road trip itinerary included a few distilleries, but there is even more to the Scotch whisky making process. The oak barrels used for aging the whisky are always used barrels, mostly bourbon barrels from the United States. When they arrive in Scotland, they need to be inspected and repaired before they can be used for whisky. This work is done by coopers, who are highly skilled in repairing barrels as quickly as possible. It is a fascinating experience to watch these highly trained coopers fly through the barrel repair process, which they do as quickly but as accurately as possible as they are paid per completed barrel. Balvenie Castle was built in the thirteenth century by the Earl of Buchan. It was a noble residence for over 400 years, but is now in ruins. One of the castle’s notable visitors was Mary Queen of Scots. While Balvenie Castle isn’t the most exciting of Scotland’s castles, it is near a field where you might find some hairy Highland cows. We really enjoy bridges and, on a road trip, stopping to look at a cool bridge doesn’t take very much time. One of the bridges for which we stopped on our Scotland road trip was Craigellachie Bridge, possibly the oldest surviving cast iron arch bridge in Scotland. The bridge was built in 1814 and provided a safe way to cross the River Spey. Elgin Cathedral may be the most beautiful ruins we have visited. I was surprised by the effect visiting Elgin Cathedral had on me. It is such an odd but interesting feeling to be standing on grass, surrounded by partial walls, and yet somehow feel that you are in an immense cathedral. Elgin Cathedral was first built in 1224. The cathedral was abandoned after the central tower collapsed on Easter Sunday in 1711. Just a few miles away from Elgin Cathedral is Spynie Palace. This is where the bishops of Moray and of Elgin Cathedral lived. One doesn’t usually think of palaces when imagining the home of bishops, but the bishops of Moray were rich and powerful. It can be easy to forget when driving around the Highlands that the ocean is just a few miles away. We found ourselves with a little extra time and decided to head straight north from Elgin to the coast. We stumbled on the beach town of Lossiemouth. Even with a little wind and a little rain, we found Lossiemouth to be a wonderfully quaint destination. Shops and restaurants line a street that parallels the water and the beach is bordered by sand dunes topped with long grasses waving in the breeze. The best way to cover a lot of territory in the Scottish Highlands is to take a road trip. This Scotland road trip itinerary not only covers many parts of the Highlands, it also provides a variety of attraction types to keep the road trip interesting. Thank you to Auto Europe, This Is Edinburgh, and the Association of Scottish Visitors Attractions for making our Scotland road trip and this post possible. As always, all opinions are my own. This article contains affiliate links. If you book through one of these links, it costs you nothing extra, but we earn a small commission which goes towards funding this website and bringing you more travel stories.